Brakes in action against Gainsborough during their last spell in the Conference North. 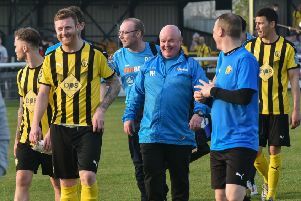 Leamington boss Paul Holleran believes the magnitude of his side’s task this season has become clearer with the release of the 2017/18 Vanarama National League North fixtures. After a trip to Gainsborough Trinity, full-time sides provide the opposition for the first two home matches of the season. It gets tougher from there with games against Kidderminster, Stockport County and Nuneaton Town to follow before a bank holiday clash at home to AFC Telford. “Every team in this division is really tough,” said Holleran. “But the first three games say we have really arrived. “Gainsborough found it hard last season but they have got resources. Brackley Town provide the opposition for matches on Boxing Day and New Year’s Day, while a trip to York City and a home clash with Salford City wrap up the campaign and Holleran is already anticipating a party atmosphere for the visit of the recently turned full-timers. “No doubt about it, they are going to win the league,” he said.